Entering the world of Mari L’Esperance’s first full-length collection, The Darkened Temple (© 2008, University of Nebraska Press), feels akin to slipping into the dark matter that engulfs our dream state. There’s a summoning taking place: images come into full resolution; memories dangle off hooks just beyond our grasp. While many of the poems arrive from a place of deep personal meaning to the poet herself, they nevertheless evoke our own senses of longing, memory and loss. I was fortunate to speak with L’Esperance a short time ago, to discuss the collection — winner of the Prairie Schooner Prize in Poetry — her process, and the source of her work. We began by talking about her thoughts around building the collection and preparing her manuscript for publication. DJ: The entire collection follows a narrative thread throughout. Was that always your intent when building this collection, or did that come more organically? ML: I wrote poems that appear in the book over a pretty broad span of time — maybe a 12 or 13 year period. When I was writing the poems I wasn’t thinking in terms of structure or a manuscript, but when I reached the point where I thought I had enough for a manuscript, I started thinking very consciously about having something of a narrative arc, or a shape to the manuscript. I wanted the book to move in a particular direction, but I didn’t write the poems themselves with that in mind. DJ: So it came about after you’d been in the process of writing? DJ: Did you have to return to any poems after arriving at that conclusion? Fill in any blanks where you wanted to build up the arc? 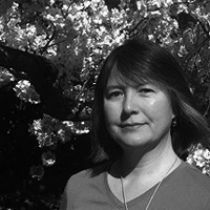 ML: After I submitted the manuscript to contests and Prairie Schooner picked it up, their editor, Hilda Raz, asked me to write, or at least add several more poems to the manuscript. I didn’t have any existing poems that I felt were appropriate or would fit the book, so I did have to write four or five new poems after the book was accepted. Then I placed them in the sequence where I thought they would fit. DJ: Did the editor offer any insight into why she wanted the additional poems? ML: I think it was more about length, and not that the manuscript felt lacking. She wanted to fill it out a little more. I was happy to do that. DJ: Where did those poems slot in? ML: Mostly in the second section. “Beyond It,” “To Her Body,” and “The Book of Ash” are three poems I added. They’re near the middle. DJ: As I was reading the collection, there were four poems specifically that felt to me to be a part of a sequence — as it happens, “Beyond It” and “To Her Body” bookend this sequence, with “Finding My Mother” and “Forgetting” in between. In looking at your arc, they do sit right at that peak, if you will — if this were a novel, these poems would be the middle chapters. Were you trying to build the feeling of a pinnacle moment with these poems? ML: I don’t think I was consciously trying to build or amplify what you refer to as a pinnacle moment. It’s possible I was attached in some way to that section of the book. There’s a lot of energy concentrated there. But I don’t think there was anything conscious about why I decided to add the poems there. When I was looking at the manuscript, that area looked like the best place where they would fit in. It’s interesting that you saw them as a sequence. I think there’s something to your observation, though I wasn’t thinking about that at all. DJ: So you were just writing them without thinking about where they’d go? ML: Yes. I wasn’t thinking about the sequence at all. DJ: What is your process, then, when you compare the art and craft of writing an individual poem vs. the art of compiling 30 or 50 poems into what you’d like to be an intentional sequence? I think that for a lot of poets, especially as it relates to first books, the idea of putting together a manuscript is foreign, or at least it’s not discussed all that much. ML: My experience with first books, when I look at others, is that the books tend to be more of a general amalgam of poems written over time. Then the poet may arrange them so they read like more of a self-contained project. I think it’s important for poets to just write poems, then figure out the sequencing after the poems are written. But that doesn’t mean it’s bad to have something of a book-length project or entity in mind before writing the poems. Then again, that can be somewhat suffocating to the writing process. Looking at this book, there’s a central theme and/or central themes that reoccur. I think a lot of poets . . . we tend to be obsessive types. From book to book, we tend to write the same poem over and over — meaning those same obsessive themes show up in our poems again and again. With that in mind, it felt like an organic process to have isolated poems, then put them together in a book. I do agree, though, that there doesn’t seem to be a lot of attention on or talk around how to arrange first books in a shape that carries the reader through from beginning to end. DJ: Do you expect that the reader would or even should read this collection in a cover-to-cover manner? ML: I think that’s the best way to read it. I like to read anyone’s collection, unless it’s an anthology, from beginning to end in a linear fashion, because I do think that a lot of poets are holding that ideal in various degrees of consciousness, sensing the book’s movement from beginning to end. I think reading the poems in the order they’re arranged gives more meaning to the reading experience. Of course there are specific poems you go back to because you’re compelled by them for whatever reason, but I think with the first read, it’s important to read from beginning to end. But that’s just me. DJ: In your collection, we know there’s this very intense middle section, where things really build up to it. There are some of the poems toward the back of the third section — “The Night Garden,” “How It Happens,” and especially “As Told By Three Rivers” — my reading is that they’re coming from a different voice. “As Told By Three Rivers” — and maybe this is just my sensibility from having grown up in Pennsylvania and having lived for a time in southeastern Ohio — something about the language has an iron ore quality to it, as if you’ve gotten the land from that part of the country into this poem. Do you feel this shift in voice might be related to when you wrote certain poems? ML: I think that’s true. “As Told By Three Rivers” is probably one of the oldest poems in the collection. The other ones you mentioned, those are all a little more recent. Again, I was just going by my intuition and my ear, and when I was arranging the poems, I wasn’t thinking about which were older, which were newer — I just wanted the manuscript to work as a coherent whole. There’s a more relaxed tone . . . a tone of release to the poems in the last section. This might lend itself to the voice you’re referring to. ML: I can still remember sitting in my old office back in Oakland and really struggling with it, wanting to make it right. I tend to write about experiences that have happened in the past, or states of mind that I’m more removed from in the present day, and are therefore a little easier to approach from the distance of art. And I do warn people that some of the poems can be hard to read. I swear — and I don’t say this in a self-aggrandizing sense — that at almost every reading, there is at least one person crying in the audience. I have a mixture of, “Oh my goodness, I really traumatized this listener,” while another part of me is grateful that they’re being touched in such a deep way. DJ: Ideally, you recognize your role in providing them an opportunity to release something. Could you tell me a little more about the process of writing “White Hydrangeas”? It’s this lovely poem broken up in small segments — does this reflect the way you wrote it, with parts coming here and there? ML: I started writing it with the intention of having it be a sequence of sections. I was initially inspired by Jane Mead, a wonderful poet who was also a teacher of mine. In her second book, she has at least one or two long poems written in these short fragments or sections that are then strung together to form the long poem. Then I just started writing it. I had a vague image in my mind of a Wallace Stevens poem — I can’t remember the title, but it starts out with him envisioning white flowers in a bowl or vase. (Editor’s note: my guess is it’s “The Poems of Our Climate.”) It was such a meditative, pure image, and I knew that I wanted that to be the central theme. These two things — the idea of the short, strung-together sections, and the white flowers — are really how it started. Then I played with it for quite a while. I started out with four or five then kept adding, then started thinking it was too long . . . ultimately it became what it is. In the end, I think the poem is a journey in itself. Structurally, how the entire book is built, it shows up right at the end of Act Two, if you will, which is the perfect place for what you wanted it to be. ML: There’s this quality when you start to write something — you have an idea of what you want, but you really aren’t sure. Often, a poem sort of says, “I want to go this way,” or, “No, I don’t want to go that way no matter what you do.” And that happens with almost every poem. I’ve had different responses to the first section, the line “To enter the mind . . .” Some people have said they found it gutsy to only have one line on a page. Hilda, when we first started talking about the manuscript, felt there was too much white space on the page. She was wondering if we could just take it out. I gave it some thought and told her I really felt I needed to have just that standalone line. She was fine with it. And other people have had a whole range of responses. I think it’s necessary for a writer to heed those inner voices that say, “This is really important” — as long as it’s helping and not hindering the work. DJ: And as long as the inner debate is healthy, and isn’t just being driven from a place that says, “No, I want to do it my way just because.” And I don’t get the sense you have that challenge. DJ: The book has a lot of Jungian qualities to it . . . the shadow self, and deep unconscious. Do dreams often weave their way into your work, whether in a literal sense or as an exercise of delving into the unconscious? ML: There’s one example in the book, “Finding My Mother,” where the images of a dream actually made their way into the book. The mother’s body lying in a field, for instance. Of course I had associations as I was writing the poem, but the dream material is woven in. Dreams are a rich source not just for writing but for teaching us things about our lives and selves. I think the unconscious is always with us, even in our waking life, and especially when we sit down to write. I feel an important aspect to the writing process is getting into that sort of dream space, the in-between reverie space where one has access to both conscious thought as well as whatever might be coming up from the subconscious. Then we mix them together in that middle realm. Obviously, I have no idea how any of this happens, but I believe it’s an important part of the process for me and a lot of other poets and writers as well. DJ: I feel that being connected to the dream life is to yield a conscious construct of the subconscious images that come, and to actually step away from as much as we can from the conscious world when trying to translate the subconscious message. I’d like to talk a little about the autobiographical component to the book, especially with the work delving into the mother relationship. Is that something you’re comfortable discussing? ML: What I’m willing to say is that my mother did go missing in 1995, and it’s an unresolved disappearance. The rest I’d like to leave to art and whatever associations readers would like to make. One of my concerns with discussing a particular poem’s theme is to be sure not to collapse the space that exists between the reader and the poem. If we give too much information about a poem, then it collapses that mystical, alchemical process that happens in the in-between. DJ: To stay there for another minute, when entering into these types of deeply personal poems, do you find it difficult to give so much to the poems, then turn them over and put them in the world? Is it a process of healing for you? ML: I think psychic distance is important, especially when writing about difficult or painful material. By the time I started getting into writing about certain things, I’d had enough distance and the necessary psychic detachment. Of course, grief has its own agenda and its own timetable. Feelings can come up at any time. Putting the poems out into the world was not as hard as sometimes reading the poems to an audience, depending on my state of mind. I will consciously not read certain poems because they feel too difficult to read. And that seems to have dissipated as time goes by, especially as the book begins to feel more and more like its own entity, and not so much a part of me. I think there was a time — not so much now — where I really feared that unleashing the book onto the world would be like committing a trauma onto my readers. “Oh no, here’s this dark, heavy, painful material . . .” There was a part of me that almost felt guilty or responsible for the reader’s experience in a way. I don’t feel that so much now. It’s art. People can take from it whatever they need to, including nothing if that’s the case.